Soldiers at Fort Hood in Killeen, Texas received training last week on how to “manage themselves in peaceful situations involving civilians,” reports KDH News. The timing of the training is interesting when analyzing America’s current economic state, which is bordering on collapse. American investment broker, businessman, author and financial commentator Peter Schiff warns us that we are in worse shape now economically than we were just before the 2008 financial crisis, which we still have yet to recover from. Soldiers whose training has always revolved around enemies in foreign combat zones, is now focused on American civilians. 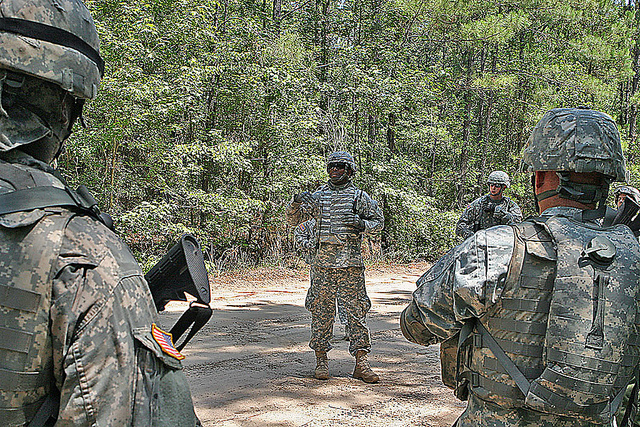 Troops underwent “crowd and riot control” training at Fort Hood’s Elijah urban training site last week. The exercises, which were originally reported by Killeen’s local news and painted in a very positive light, also involved the use of “role players.” The report states the potential uses for the crowd control training ranges from “peaceful protestors to full on riots,” and also includes how to deal with natural disasters, such as Hurricane Katrina. In an obvious attempt to normalize the training, and prevent the public from panicking, the paper’s report quoted military personnel as basically loving the new exercises. 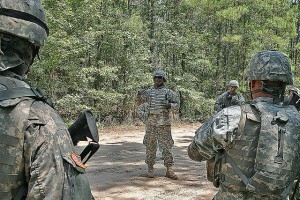 Soldiers reportedly learned unifying formations, verbal and hand signals, and chants including “Get Back”– which is meant to be spoken while soldiers step their feet towards the crowd in an intimidating fashion. His statement to the paper defending the training is to be expected, however, we know that the training is not meant to help soldiers deal with civil unrest peacefully, but in a police state-like manner meant to suppress, injure, arrest and potentially kill peaceful protestors. Inside military sources have repeatedly confirmed the military is planning and training for civil unrest. The federalization of the police force is one of the best indicators of this. Police departments all over the nation, even tiny rural communities, are receiving robust, intimidating military equipment designed to be used against civilians for next to nothing in costs. The Ala. Cullman Police Department recently received a $400,000 armored MRAP (Mine-Resistant Ambush Protected) surplus military vehicle for free, meant for use by the tactic unit. “The department applied for the military surplus vehicle, much like other police departments are receiving military vehicles to be used for tactical purposes,” said the police chief. They argue it will be used to respond to active shooter scenarios and “certain situations” that may occur in the community. In February Infowars broke the story exposing a DHS supplier that was providing the government agency with shooting targets featuring pregnant women, mothers in playgrounds and elderly American gun owners. Also, the DHS has been arming themselves to the teeth with over 2 billion rounds of ammunition throughout last year, which is enough to wage a 30-year war.